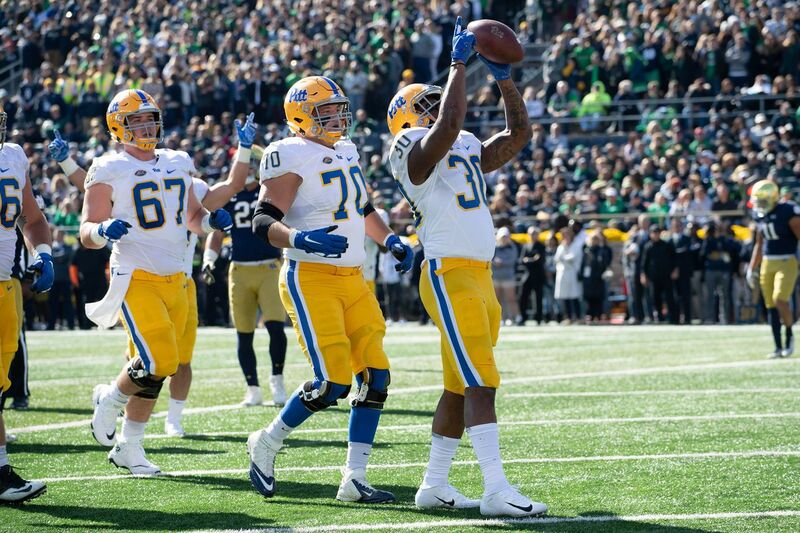 Seven games into the 2018 football season, Pitt is 3-4 following a closer-than-expected loss to No. 5 Notre Dame this weekend. Now, 3-4 is nothing to write home about. But as lackluster as that record is, the Panthers’ season is far from over. And not only is it far from over, there are a few different ways this can end. That’s because, for as weak as that record is, Pitt is still 2-1 in the ACC and only 1/2 game behind first place Virginia Tech, a team they’ve not yet faced. The other 2-1 teams currently tied with Pitt are Duke and Virginia - also teams the Panthers haven’t played yet. Though unlikely, the Panthers control their own destiny to win the Division. Despite some solid play of late, Pitt was also roughed up by Penn State and UCF while losing to what looks like a pretty weak North Carolina team. 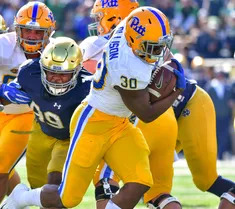 There are quarterback questions and Pitt just lost one of the team’s top defensive players for the season. The schedule is not an easy one, either, with three road games. And even the two home contests are against Virginia Tech and Duke, who are a combined 9-3. Things could go very badly the rest of the way. The thought here is that Pitt could conceivably finish something like 1-4. Miami and Virginia Tech, while not unbeatable, are both games that could very easily end in losses. Even arguably more manageable opponents like Duke and Virginia don’t represent gimme wins. Those teams are a combined 9-3 and have their own aspirations of factoring into the Coastal race. The weakest team left for the Panthers is 3-3 Wake Forest. I doubt the Panthers will go winless but 1-4 is probably not entirely out of the discussion. And if that’s the way the season ends, it would obviously be a big disappointment. Do I particularly see this option? Not really. Pitt has shown themselves to be too good to probably land here. Not consistently good, mind you. But I do think they are haphazardly good enough that they should win at least two more games. A more likely result is that the team continues doing what it’s done all year - and that’s looking good at times and bad at others. This, to me, is probably the most reasonable path. I’m guessing others feel the same way. All year long, Pitt has been up and down. They looked predictably good against Albany, won a nice game against Georgia Tech, pulled off a mini-shocker against Syracuse, and looked surprisingly good against Notre Dame. Conversely, they looked ugly against Penn State and UCF. They lost to North Carolina. The chances that continues are probably somewhat high. Here, we’d be looking at 2-3 or 3-2. Maybe Pitt splits with Virginia Tech and Miami and does the same against Duke and Virginia while beating Wake Forest. Or maybe they can’t manage to defeat either the Hokies or Hurricanes. Other scenarios exist, too. But the overall result is a somewhat bumpy, up and down ride. Obviously getting to three wins is important so it’s not as if these two results are exactly the same. 3-2 gets Pitt to a bowl and shows small progress while 2-3 does not. But both records avoids complete disaster and also leave Pitt short of its ultimate goal. The third scenario is certainly what the team will be looking to do - and that’s to become legit Division contenders. That seemed incredibly unlikely as recently as two games ago. But then Pitt upset Syracuse and took Notre Dame to the limit. Further, the Coastal has proven to be more winnable with Miami tripping up against Virginia and Virginia Tech looking somewhat vulnerable, too, losing to Old Dominion a few weeks ago and nearly falling to North Carolina this weekend. There’s just no clear favorite at this point. The Panthers’ in-conference games so far are also what have kept them alive despite the bad overall record. Look at Georgia Tech, for example. They, too, are 3-4. But at only 1-3 in the conference, they are out of the running. Pitt’s sole conference loss to this point is to North Carolina and the Tar Heels already have two ACC losses and are likely not contenders, either. Regardless of whether you think Pitt can contend or not, the reality is that at 2-1, they are still in the mix. In this scenario, Pitt certainly defeats Wake Forest and needs to win at least three of the other four games to have any kind of a shot at the Division. And just as there’s no real favorite, the Division’s final contenders are also very much up in the air. Heading into this weekend, it looked like Miami and Virginia Tech. But the Hurricanes were just upset by Virginia. Duke is there at 5-1. So determining which games Pitt needs to win the most is still an unknown. But they likely won’t be able to seriously compete for the Division without likely a 4-1 run and even that might not do it if the loss comes to the wrong team. Frankly, I don’t know that I see this one. It’s not only games against Virginia Tech and Miami that Pitt has to worry about. They also still have to play some good Virginia and Duke teams, too. I’ll give Pitt the Wake Forest game but, beyond that, winning three out of four there might be too much to ask for. Where Pitt ultimately winds up is anybody’s guess. But even though we’re past the midway point in the year, the season can still wind up a success or a complete disaster.